26 Jewish cemeteries were identified in this country as of 1999 by Srdjan Matic, MD, New York, NY 10025. Muslim/Croat Federation of Bosnia and Herzegovina (Federacija Bosnia i Herzegovina). The Muslim/Croat Federation is comprised of 10 cantons: Goradzde (5), Livno (10), Middle Bosnia (6), Neretva (7), Posavina (2), Sarajevo (9), Tuzla Podrinje (3), Una Sana (1), West Herzegovina (8), and Zenica Doboj (4). JewishGen's ShtetlSeeker references border changes to locate a given town. Post-Second World War communist Yugoslavia (six federated republics: Serbia, Croatia, Slovenia, Bosnia-Herzegovina, Macedonia, and Montenegro under Marshal Josip Broz Tito): Jewish life began to return to the Balkans. With approximately 14,500 out of a pre-war population of 16,000 Serbian Jews killed, from 1948 many of those survivors migrated to Israel. Abandoned and ruined synagogues and cemeteries: Former synagogues gradually weree either demolished or had new uses. Many cemeteries were abandoned with some pillaged and gravestones used for construction. Others became overgrown and almost forgotten. The Jewish community (about 6,000 people throughout the former Yugoslavia) was recognised as both an ethnic and a religious community. Communist Yugoslavia was not a part of the Soviet bloc so local Jews were not persecuted or isolated. They further assimilated into society and lost contact with religious life. There was only one rabbi in the country. The Federation of Yugoslav Jewish Communities cared for Jewish cemeteries, synagogues, and other infrastructure where communities no longer exist. Some cemeteries were moved. Some were maintained. 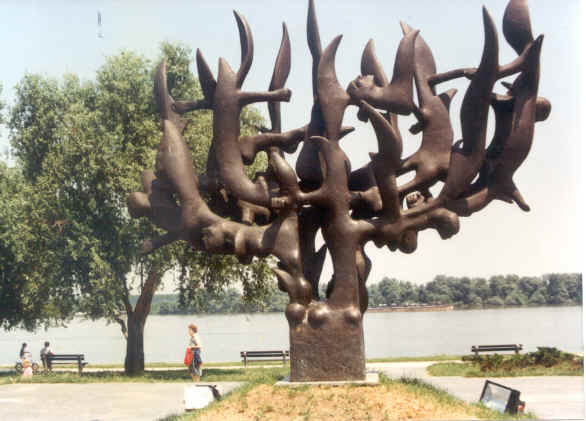 The Jewish community also erected close to thirty memorials within former Yugoslavia to commemorate Jews lost during the war. Throughout the 1980s, wide-ranging programs run by the Federation and individual Jewish communities were helped by international Jewish philanthropy. This began with the secession of Slovenia, and then of Croatia and Bosnia-Herzegovina, in 1991. A series of bloody Balkan wars tore apart the country, left hundreds of thousands of dead and millions displaced, and destroyed thousands of religious, cultural and historic heritage sites. The state's collapse made the the continuation of Jewish institutions particularly difficult, even without the trauma of war and the Jewish emigration that resulted. Gradually the small Jewish communities of the former Yugoslavia have recreated themselves as more locally-based organisations, gradually rebuilt earlier connections, and expanded their association with Jewish communities and institutions in Israel and throughout Europe. Anastasijevic, Dejan. 'The Synagogue in Zemun: Synagogue, restaurant, shooting Range,' Vreme News Digest Agency 290, 26 April 1997. Encyclopedia of the Holocaust, New York: Macmillan Publishing Company, 1990. Gruber, Ruth Ellen. Upon the Doorposts of Thy House: Jewish Life in East-Central Europe, Yesterday and Today, New York: John Wiley & Sons, 1994. Gruber, Ruth Ellen. Preliminary Survey of Historic Jewish Sites in Serbia and Montenegro, United States Commission for the Preservation of America's Heritage Abroad, Washington, 2003. Gruber, Ruth Ellen. Jewish Heritage Travel: A Guide to Eastern Europe (new edition), New York: National Geographic, 2007. Krinsky, Carol Herselle. Synagogues of Europe, Boston: The Architectural History Foundation and the MIT Press, 1985. Mihailovic, Milica. 'The Jewish Historical Museum, Belgrade'. European Judaism: A Journal for the New Europe, 2003, 36.2, 62-73. Tomasevic, Nebojsa. Treasures of Yugoslavia: An Encyclopedic Touring Guide, Belgrade: Yugoslaviapublic, 1980. United States Commission for the Preservation of America's Heritage Abroad: Gruber 2002 and Čerešnješ (forthcoming). Ivan Čerešnješ was former president of the Jewish Community of Sarajevo. Beiser, Vince. ‘A will to survive', The Jerusalem Report, 2 May 1996. Bosnian Culture Days. Bosniens Juden: Legende-Tradition-Leben, Vienna, October-November, 1996. Čerešnješ, Ivan. Caught in the Winds of War: Jews in the Former Yugoslavia. Jerusalem: World Jewish Congress, 1999. Čerešnješ, Ivan/United States Commission for the Preservation of America's Heritage Abroad. Jewish Heritage Sites in Bosnia and Herzegovina (forthcoming). Gotovac, Vedrana. Sinagoge u Bosni i Hercegovnini. Sarajevo: Muzej Grada Sarajeva, 1987. Gruber, Ruth Ellen.‘Serbs demand their "share" of rare Sarajevo Haggadah', Jewish Telegraph Agency, 24 December 1998. Gruber, Ruth Ellen. ‘New synagogue project unites Bosnians of different backgrounds', Jewish Telegraph Agency, 25 April 2001. Gruber, Ruth Ellen. 'Sarajevo Haggadah restored - Next up: putting it up on display', Jewish Telegraph Agency, 9 January, 2002. Gruber, Ruth Ellen. Jewish Heritage in Bosnia and Herzegovina, Preliminary Report to the United States Commission for the Preservation of America's Heritage Abroad (2002). Gruber, Ruth Ellen. ‘Priceless 14th-century Haggadah on permanent display in Sarajevo', Jewish Telegraph Agency, 3 December 2002. Gruber, Ruth Ellen. ‘After 60 years, prayer returns to historic Sarajevo synagogue', Jewish Telegraph Agency, 27 September 2004. Gruber, Ruth Ellen. ‘Illuminated Sarajevo Haggadah is being reproduced for Passover', Jewish Telegraph Agency, 3 April 2006. Herscher, Andrew. ‘Remembering and rebuilding in Bosnia', Transitions: Changes in Post-Communist Societies, 5:3, March 1998, 76-81. Jews in Yugoslavia (exhibition catalogue), Zagreb: Muzejski Prostor, 1989. Krinsky, Carol Herselle. Synagogues of Europe. Boston: The Architectural History Foundation and the MIT Press, 1985. Mooney, Bel. ‘Saviours scorned', The Times, London, 30 November 1996. Serotta, Edward. Survival in Sarajevo: How a Jewish community came to the aid of its city, Vienna: Brandstätter, 1994. Tomasevic, Nebojsa. Treasures of Yugoslavia: An encyclopedic touring guide. Belgrade: Yugoslaviapublic, 1980. Werber, Eugen. The Sarajevo Haggadah. Sarajevo: Proveta-Svjetlost, 1983.